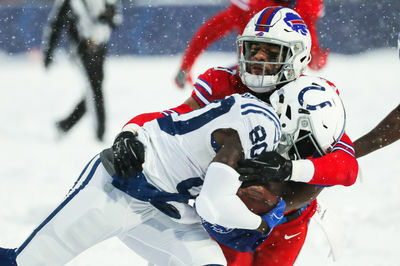 - The biggest free agent acquisition of the 2017 offseason from a financial perspective, Micah Hyde stepped in and was better than the Bills probably could have expected him to be when they signed him. Needing a significant upgrade at safety from what they had the prior year, Hyde came in and showed terrific athleticism, instincts, and playmaking ability to help turn the position from a weakness into the strongest on the team. He was also a great tackler throughout the season and primarily when the run defense was porous up the middle, Hyde was there to clean up the mess in front of him. Still only 27 years old, Hyde is right in the prime of his career and has a large window to stay at the level he showed during the 2017 season. - Hyde will team up with Jordan Poyer for the second straight season as one of the best safety duos in the NFL. The two of them work so well together, and they give the coaching staff the versatility to make them interchangeable as the deep safety. Hyde has the flexibility to turn and run with tight ends and wide receivers, and that skill will -- at least you would think -- continue to help him be one of the top players on the roster. If Hyde suffers any injury, the Bills will lose quite a bit on the backend in what has turned out to be an outright strength for Buffalo over the past 12 months.